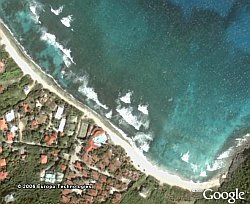 Download (if you haven't already) the GoogleEarth satellite imaging program from Google.com and use it to scour the Earth's remote coastlines for potential wave set-ups from the comfort of your own home. When you find a good one, make a jpg. 'frame grab' or a hard copy print out of the set-up, with the coordinates provided by Google Earth on the page...We'll choose the set-up with the most potential as a NEW DISCOVERY and, if it's yours, we'll not only set you up with a killer prize pack of shorts/sandals/tide watches/backpack courtesy of Quiksilver Travel, but we'll also take you (along with a few top pros and one of our veteran photographers) there to surf place. Read the web page for the full details - the cutoff date is 27-August-2006 for submittals. Thanks to Frank McVey for the heads up. Looks cool... I love these kinds of Google Earth contests (and finding beaches).